Email is one of the most commonly used methods of attack on an organization. 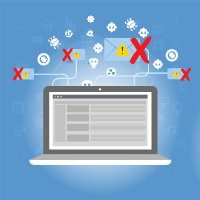 Spam - unsolicited emails sent in mass quantities - can cause serious problems beyond annoyance. It is commonly used as dangerous phishing attempts to maliciously obtain sensitive information, including credit card numbers, passwords, usernames, and other personal and company information. WatchGuard spamBlocker provides the advanced security your organization needs with real-time, continuous, and highly reliable protection from spam and phishing attempts. All SpamBlocker licenses can be found on their own individual product pages or purchase them below, more options can be found on individual product pages. Can't find the part you are looking for? Contact us today! 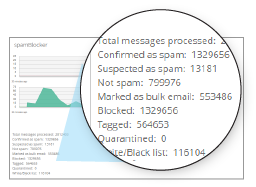 Using the industry-leading Recurrent Pattern Detection (RPD™) technology, WatchGuard spamBlocker instantly identifies outbreaks as they emerge for continuous protection from email-based threats - blocking nearly 100 percent of unwanted and dangerous emails. RPD also provides an extra layer of malware protection as it immediately detects emails carrying viral payloads, and with virtually no false positives, you can be confident that important, legitimate emails are received. WatchGuard spamBlocker works on both SMTP and POP3 email protocols, and it provides highly reliable protection regardless of the language, format, or content of the message. Most of the processing power is also done outside the Internet gateway, so WatchGuard spamBlocker requires minimal bandwidth and CPU power, delivering optimal network performance. 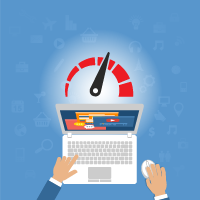 From an intuitive management console, you choose to allow, deny, quarantine, and tag emails for easy identification by spam level, including confirmed, bulk, and suspect. You can also use flexible white lists to create exceptions that allow or deny emails for specific senders and recipients. By selecting the Virus Outbreak Detection feature, you also add an extra layer of security by enabling the system to examine file attachments to identify if the distribution pattern resembles malware. Using WatchGuard Dimension, you get detailed reports on the types of spam identified, the senders, and recipients. You are also able to quickly view graphs that include the total number of messages scanned over a set period of time and the number of emails identified by threat level. 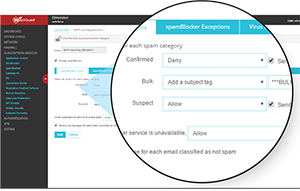 When the Firebox receives inbound email, it queries the spamBlocker cloud service to match data to determine if it is known spam, and then allows, blocks, or quarantines the email based on the spam score.